absolutely! i'd really love to see him draw a story arc. So are we gonna get an issue of Universe where the Turtles fufill their contractual obligations? Oh and one more thing, with that small cameo, IDW has come closer to featuring the Flaming Carrot than Nickelodeon ever did. What a hilarious issue! I was laughing all the way from Hakk-r's entrance to the very last panel. I feel sorry for the guy, he had no idea what he was getting into with this specific target! And the wrestling outfits from Archie! Yes! So much win! Also, a neat little coincidence(?) in that Cryin' Houn's look is clearly based on Elvis Presley, and today is the anniversary of his death. I wouldn't be surprised to find out that was an intentional tribute. Here's my full summary and review of TMNT: Dimension X #3 at TMNT Entity. This was the issue of the mini I was looking forward to the most, and the part of the storyline IDW seemed to hype up the most with those Pitarra covers. I wasn't disappointed! Sitterson found a great balance of adding new takes on classic characters without taking them too far away from who they are and how we recognize them. And the art and coloring from Randolph/Rauch really stood out to be; loved the "lighting" and all the perspective angles. Though are we gonna get Ace Duck or not?! Isn't Ace Duck on one of the covers or did I imagine that? Weird that he wasn't here. He is on the covers. I think he's in the next issue. Loved the art. Story was amusing, I guess. Hakkr has really been going through a fast villain decay cycle, though, hasn't he? It'll be even weirder if he's back up to "badass status" in Issues #74 and #75. Isn't Ace Duck listed as an upcoming character in the previews? An ex-pilot who was forced into Stump Wrestling? I'm predicting now that Ace Duck is gonna be a Han Solo type character. Smuggler pilot. In this issue we see many easter eggs. Some of them I recognize, some not. So please help! who is that Dark Beast like manager guy? Leo's ring costume - is there an action figure or is a homage, too? Donnie's ring costume - is there an action figure or is a homage, too? Am I right or wrong? What do you think? 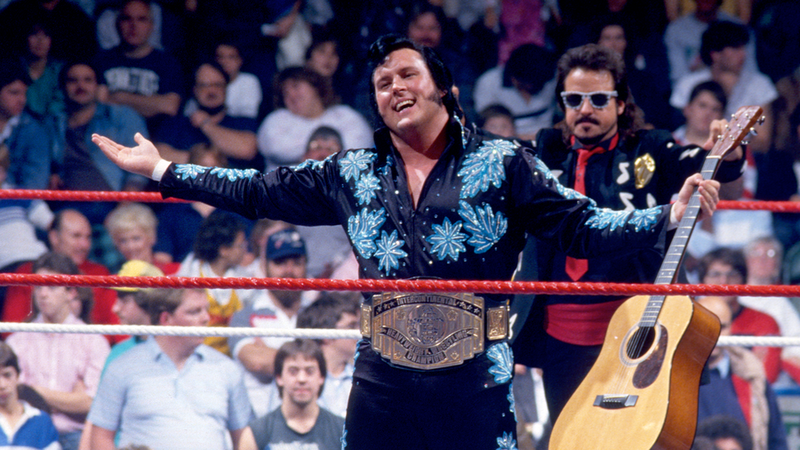 i'm thinking he's based off the wrestler the 'Honky Tonk Man', who was an Elvis knock-off. PWG shirt on a fan in the crowd on the 3rd to last page! PWG is a California based independent wrestling league. for a moment there I thought I saw triple threat. I was a little surprised Triple Threat didn't pop up in this issue... perfect place for a cameo, a little extra credit, and then never use him again. It was something I had been meaning to do for a while now, but tonight, in the wake of #76, I finally went back and re-read Trial of Krang plus Dimension X. 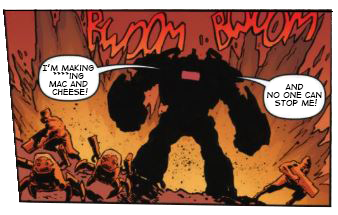 And I have to say, this one particular issue is probably one of the best-written in all of IDW TMNT. It's just so damn funny! This series' art is praised on a regular basis, yet hardly anyone mentions the writing, when it's just as top notch. Hakk-R comes across almost like a Joss Whedon villain here. Which is fitting, considering that in the very next issue he goes after a character who, if not for his appearance, could very well have stepped directly out of Firefly. That bit when he starts to break under the weight of the ridiculous predicament he finds himself in (not to mention the weight of Cryin' Houn'!) right before Mikey leaps into the ring with a big splash-worthy "Cowabunga!" still has me in stitches just as much as the first time. The creature with multiple eye-stalks in the lower left is particularly noticeable in this issue, as is the off-brand Triceraton and at least one other alien that I can't point out specifically but just know is in there too. All in all, great stuff! Finding new things upon re-reading is the mark of a job well done. I never noticed until now, but is that Fluffy Brockleton smack-dab in the middle of that page? If so, could it be that he also cameoed in this issue? Fluffy was later seen in as a cameo in the audience, along with Gizmo, of a Stump Wrestling match during Teenage Mutant Ninja Turtles Adventures. Much the same as that almost-but-not-quite Triceraton in the upper row, it could be a shoutout to characters that didn't make it into the Archie series. Last edited by ChosenOne; 11-16-2017 at 07:43 AM.